A lot changed between Octopus 1.6 and Octopus 2.0; so much that we had to to handle upgrades differently to the way we handle upgrades from, say, Octopus 1.5 to Octopus 1.6. This page will walk you through the process of upgrading an Octopus 1.6 instance to Octopus 2.0. Rather than being an in-place upgrade, Octopus 2.0 is designed to be a side-by-side upgrade. If your Octopus 1.x installation is at an earlier version than Octopus 1.6, please upgrade it to Octopus 1.6 before proceeding. 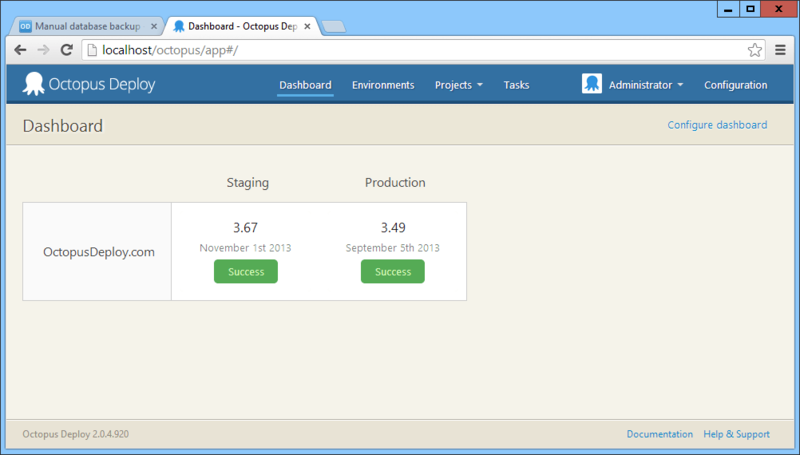 Below is the dashboard from an Octopus 1.6 server that will be used as an example for this walkthrough. Before attempting to migrate, make sure that you don't have any projects, environments, or machines with duplicated names (this is no longer allowed in Octopus 2.0, and the migration wizard will report an error if it finds duplicates). 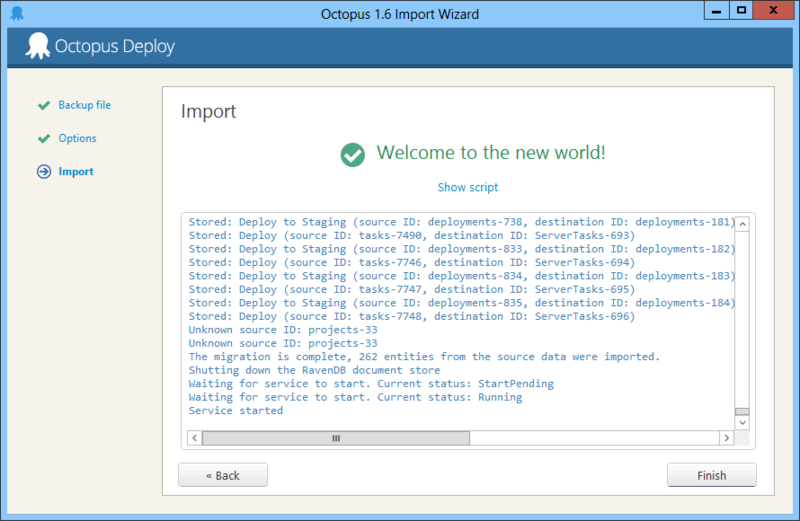 Next, install Octopus 2.0, either on the same server as your current Octopus 1.6 server, or on a new server (ideal). Octopus 2.0 uses different paths, ports and service names to Octopus 1.0 so there should not be any conflicts between them. View our guide to installing an Octopus 2.0, which includes a video walkthrough. 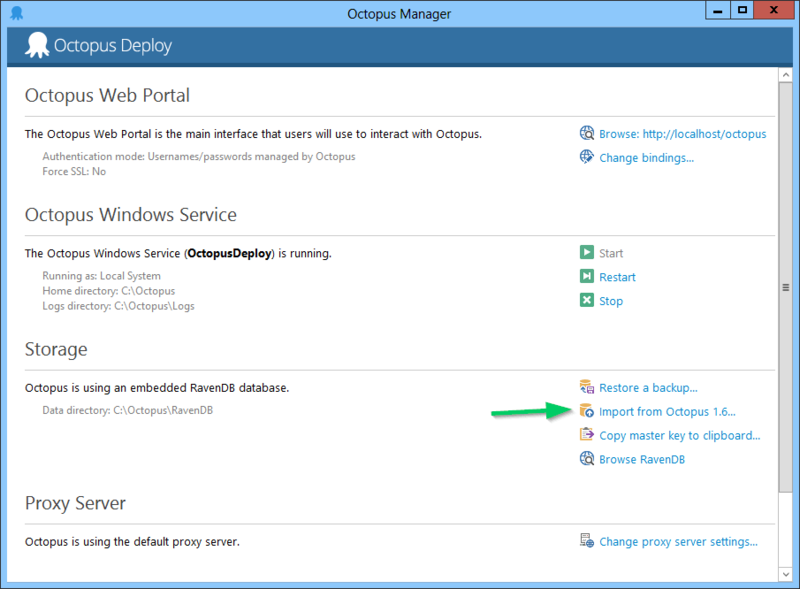 On the Octopus 2.0 server, open the Octopus Manager from your start menu/start screen. Next, you'll be asked if you want to change the Tentacle port on all machines that get imported. For more information on why you might like to do this, see the section on upgrading Tentacles below. If you don't change the Tentacle port, make sure you completely shut down your Octopus 1.6 server after the upgrade, or remove the upgraded machines from it. Leaving the Octopus 1.6 server running will generate large numbers of invalid connection attempts from the old server to the new Tentacles, and this can adversely affect performance. 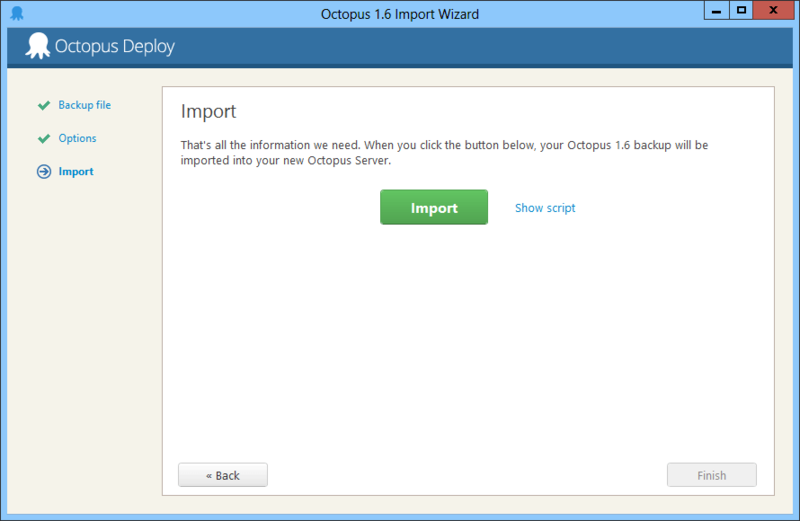 Next, click Import and your Octopus 1.6 backup will be imported. The import process will take a few minutes to run, and any errors will be reported in the output window. At this point, you should be able to view the imported projects, environments and machines, but all the machines will be offline. The Octopus 2.x migrator will not import permission settings from Octopus 1.6, due to changes made between the permission models. After you upgrade to Octopus 2.x, you will need to configure Teams to assign permissions. Octopus 2.x changed the communication stack between Octopus and Tentacle, meaning that your Octopus 2.x server can no longer communicate with Tentacle 1.6. So in addition to upgrading Octopus, you'll also need to upgrade any Tentacles. The following PowerShell script can be used to download the latest Tentacle MSI, install it, import the X.509 certificate used for Tentacle 1.6, and configure it in listening mode. 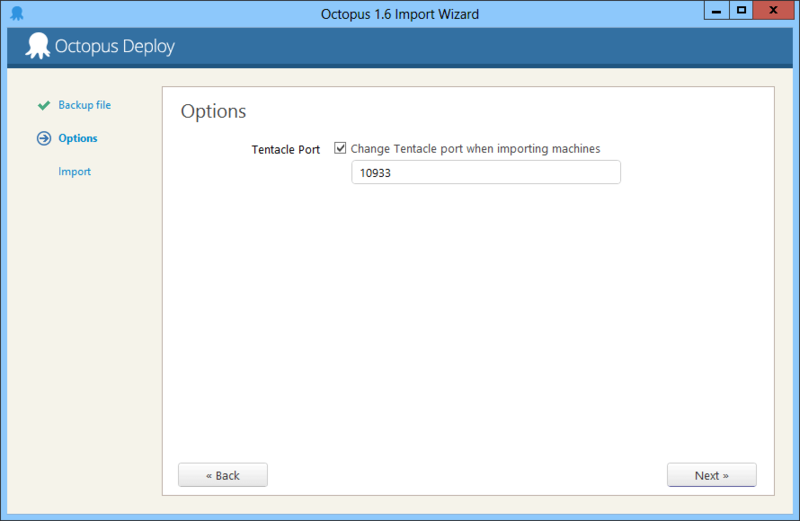 Write-Output "Uninstalling the 1.0 Tentacle"
$app = Get-WmiObject -Query "SELECT * FROM Win32_Product WHERE Name = 'Octopus Deploy Tentacle' AND Version < 2.0"
& sc.exe delete "Octopus Tentacle"
Write-Output "Downloading Octopus Tentacle MSI..."
Write-Output "Tentacle MSI installer returned exit code $msiExitCode"
Write-Output "Configuring the 2.0 Tentacle"
& .\tentacle.exe configure --instance "Tentacle" --trust="$sthumb"
Write-Output "Stopping the 1.0 Tentacle"
Write-Output "Starting the 2.0 Tentacle"